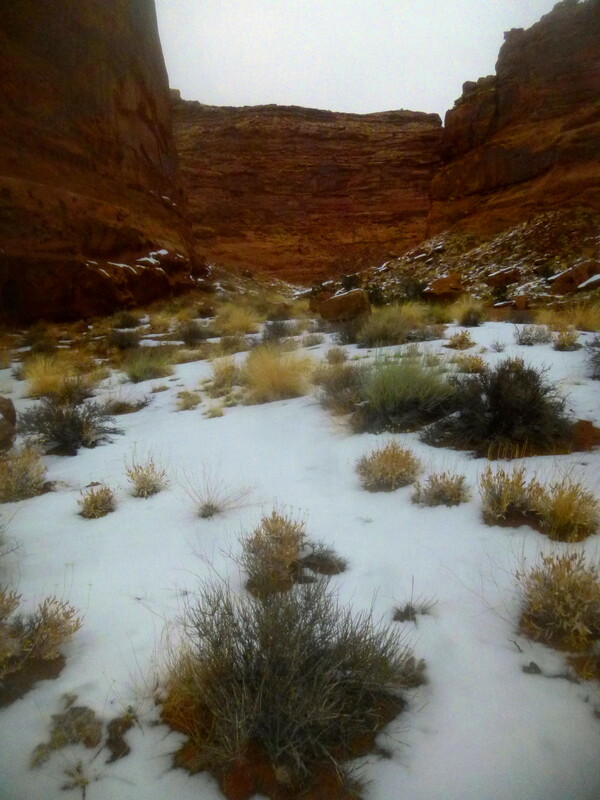 Stair Canyon is an isolated place in an already sparsely-visited area. 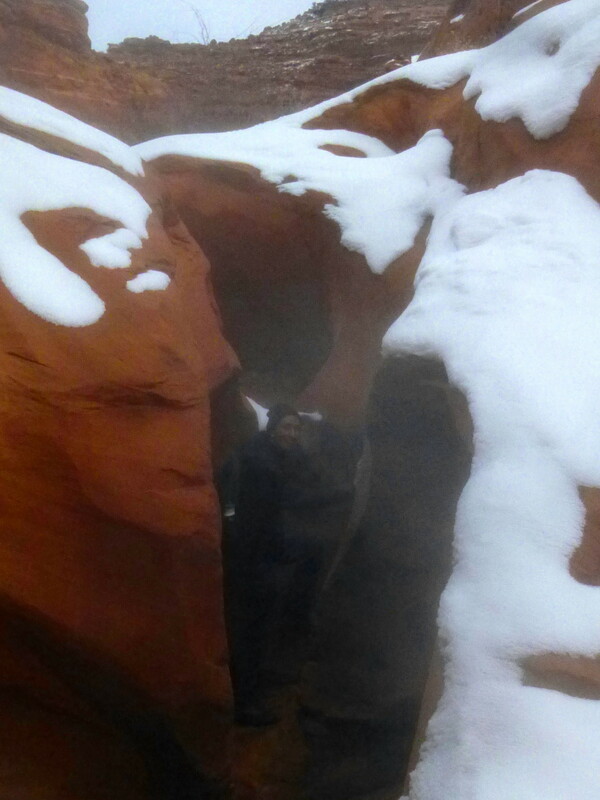 The area known collectively as North Wash—between Hanksville, UT and the upper reaches of Lake Powell—is often frequented by the canyoneering types with their ropes and belays and fancy footwork, but there is very little advertised in the way of non-technical day hikes. 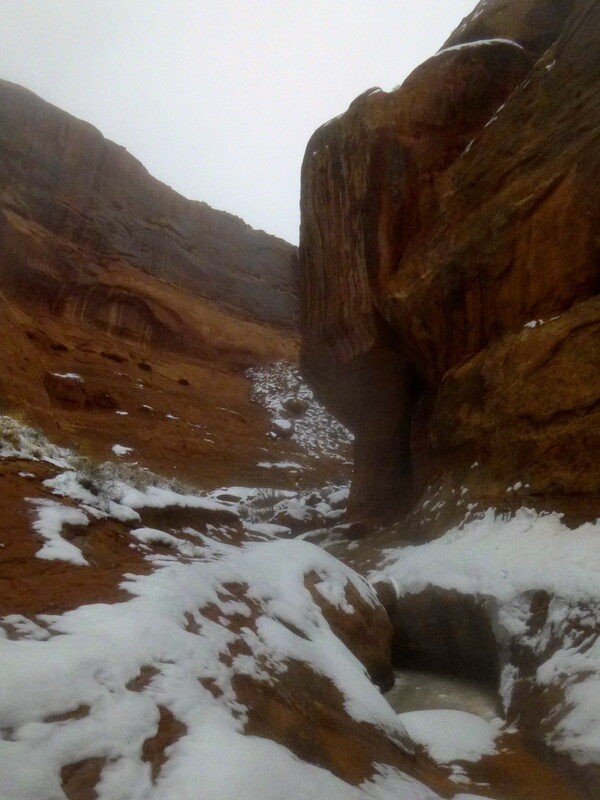 This is not for lack of options: dozens of canyons feed into broad North Wash, begging to be explored. 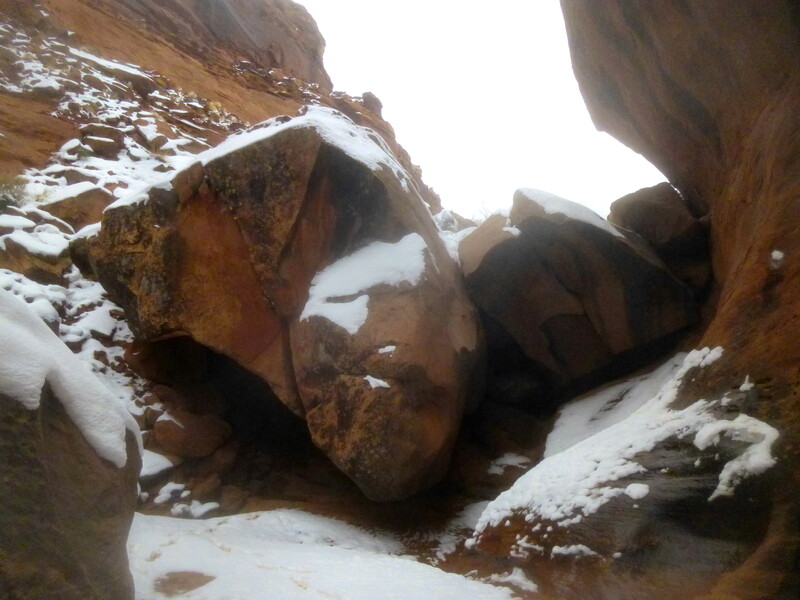 Ron Adkison’s Hiking Grand Staircase-Escalante & the Glen Canyon Region—the sole reliable resource I could find on day hikes in the area—lists four enticing trips up some of these tributaries: Butler, Stair, Hog, and Marinus. Among these, Adkison singles out Stair Canyon—rimmed by deep red, honeycombed cliffs and chock-full of willows, cottonwoods, and the occasional juniper—as North Wash’s “most interesting to explore.” It’s a rugged hike up-canyon—without a trail, the route simply follows the wash bottom—through occasional willow thickets, slots, and boulder jams, but the serenity and isolation of the confluence of Stair’s two upper forks offers an excellent destination for a day in an underappreciated section of southern Utah. Though its many side canyons are rarely explored, North Wash is easy to access, as state highway 95 (a.k.a. the “Bicentennial Highway”) runs right down its gut. Finding the trailhead, however, can be somewhat difficult: the area listed as “Three Forks” on topo maps—the confluence of North Wash with Butler and Stair Canyons—is located 20 miles northwest of Hite Marina at Lake Powell, or five miles southeast of the junction of Highway 95 and state route 276. Approaching from the north, the confluence will be on your left: it’s the only spot where two large side canyons appear to converge on the road at once. Park along Highway 95 upon spotting the forks: your hike begins here. 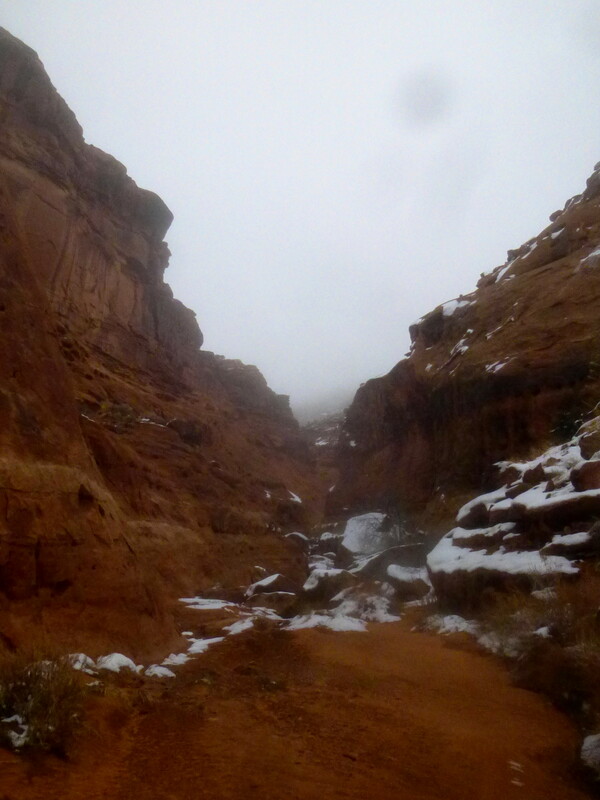 Again, there is no trail, though the wash bottom through Stair Canyon serves as your guide. 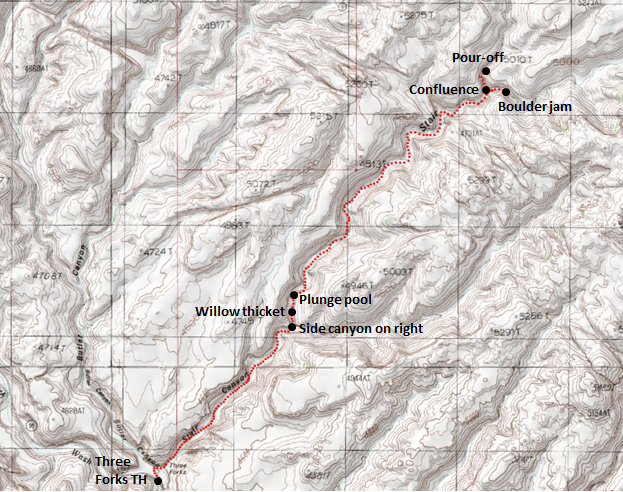 Start by walking up the road 100 feet or so (northwest, toward Butler Canyon) to avoid a precipitous 5-foot drop into the wash bottom just beside the parking area. This detour will also avoid a tangle of nasty sagebrush and reed grass at the canyon’s mouth. Drop into the wash and follow it back south, turning east into the obvious drainage that leads through a community of willows and into Stair Canyon. 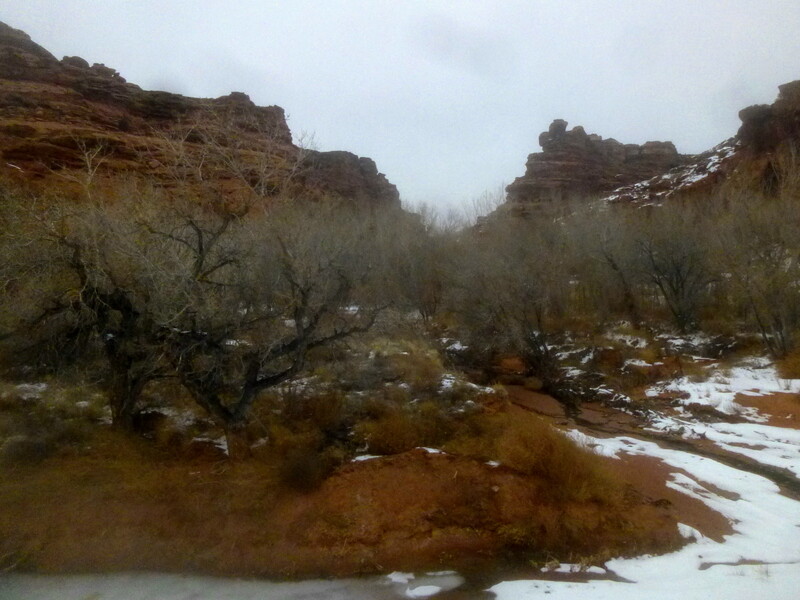 After clearing Three Forks, the vegetation thins out and the broad, sandy canyon bottom opens up. On the left, an ornate reddish wall speckled with solution cavities flanks the edge of the wash. Ahead, on the right-hand side, a thumbs-up shaped rock tops the ledgey canyon wall. A small arch, up high near the rim, will appear opposite the thumb on the left. The entirety of the hike lies within the rock layer known as Wingate sandstone—responsible for a vast amount of Utah’s awe-dropping cliffs. 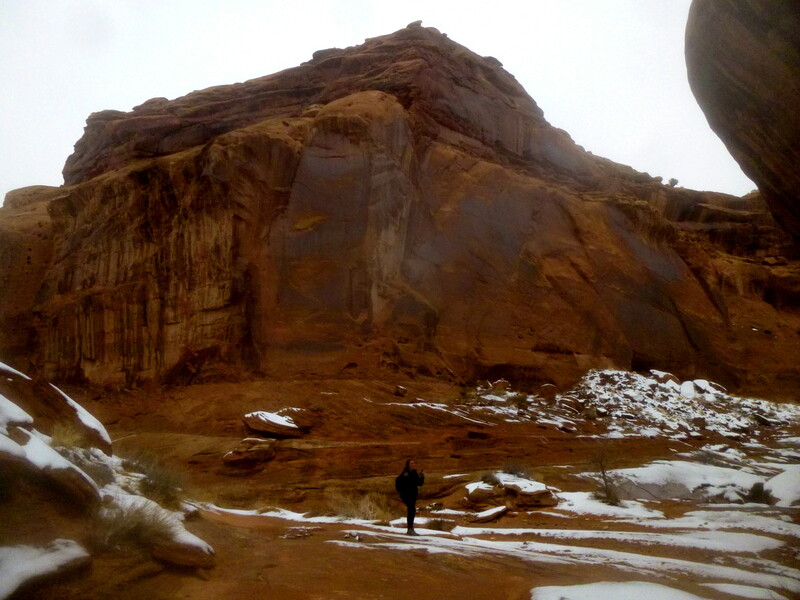 Unlike the more gently-sloping Kayenta formation (visible atop the canyon walls), Wingate sandstone often erodes in chunks, with entire slices of rock tumbling to the canyon bottoms below. After about ¼ mile of hiking, the flat bottom again wades into a thicket of trees—this time mostly gnarly cottonwoods. 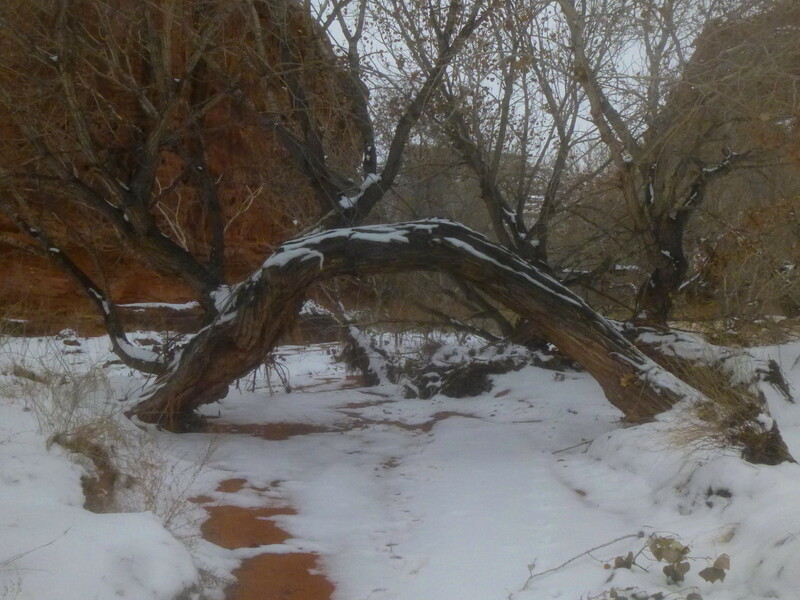 One particularly interesting tree root forms an archway directly over the wash. Unless you are unusually tall, it’s possible to pass directly under this peculiar spectacle. From here the dry wash passes in and out of cottonwood and oak groves; after roughly ¾ mile, the drainage forms a narrow bend, carving a 4-foot deep mini-narrows of sorts where standing water may be present (it was up to a few inches depth in January 2015). This brushy (and rather stinky) section can be easily bypassed by following a faint use trail onto a bench on the right. From here, meet up again with the wash bottom where possible and continue around ½ mile up-canyon to the beginning of the narrows section, which begins shortly after passing the mouth of a side canyon coming in from the right. 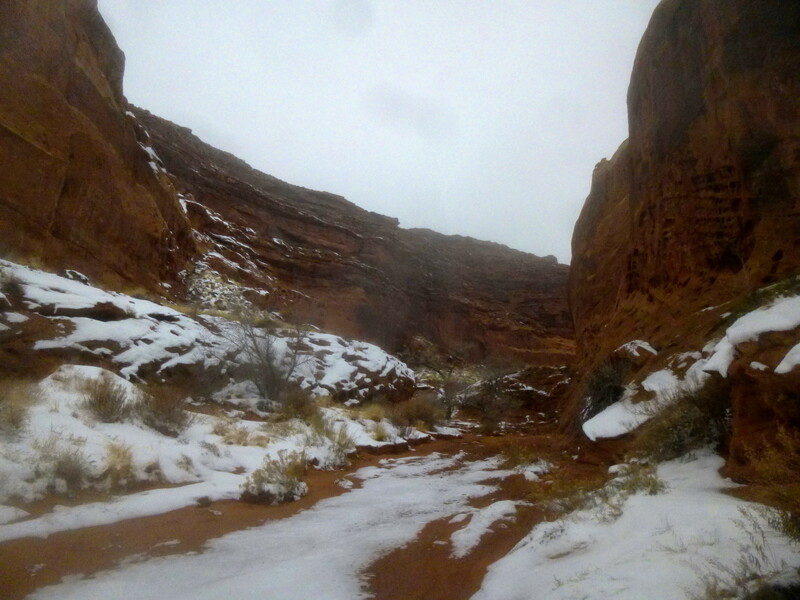 An abrupt left turn reveals two canyons in one: the wider gorge with 300-foot canyon walls and a gradually narrowing ravine that envelops the wash itself at a width of 5-20 feet. 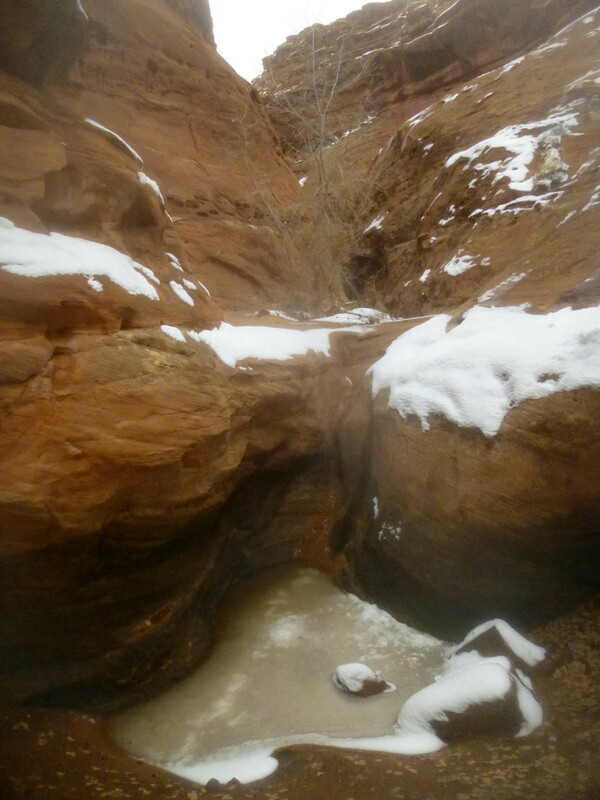 2/10 of a mile from the side canyon, the main wash becomes confined between a protruding shelf and a honeycombed northern wall, offering a choice of two undesirable routes: the water-logged (or at least muddy) creek bed to the right, or a dense grove of willows on the left. Most will opt for the willows, which are thick and pointy but passable with caution. Many have toppled in flash floods, creating a horizontal rather than vertical annoyance. Follow a faint use trail across the bench, passing countless cacti, Mormon tea plants, and patches of cryptobiotic soil. Another interesting rock knob protrudes over the cliffs on the right. Much farther down, at ground level, an orange, honeycombed boulder sits precariously atop a smaller rock on the edge of the shelf (it seems sure to tumble into the wash someday). 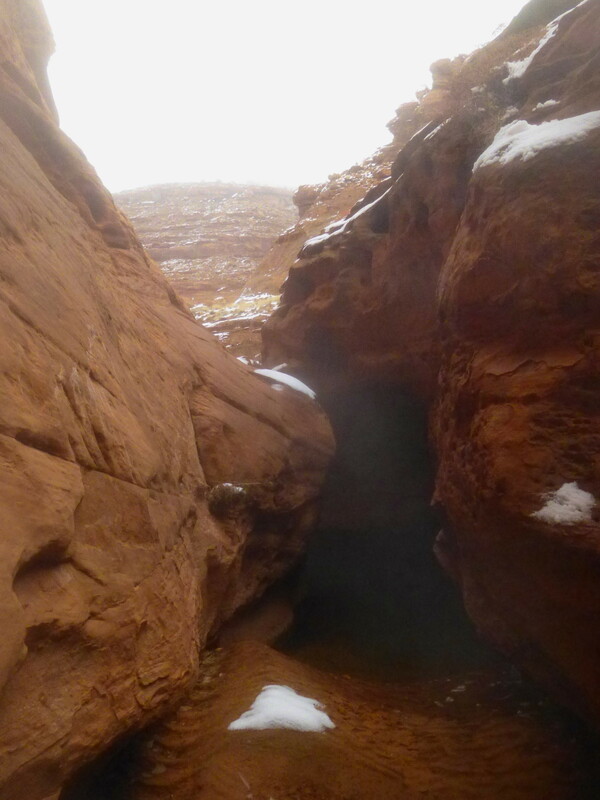 You will also thank yourself around here for not attempting to ascend via the plunge pool; just past the boulder, down in the narrows, lies a second muddy pothole and a 5-foot dry fall. After this second pool, it is safe to drop back again into the sandy wash, which is now out in the open and free of significant obstacles. However, upon reaching a left-turning bend, you will want to ascend a sandy hillside on your left to avoid a boulder jam about 100 yards upstream. 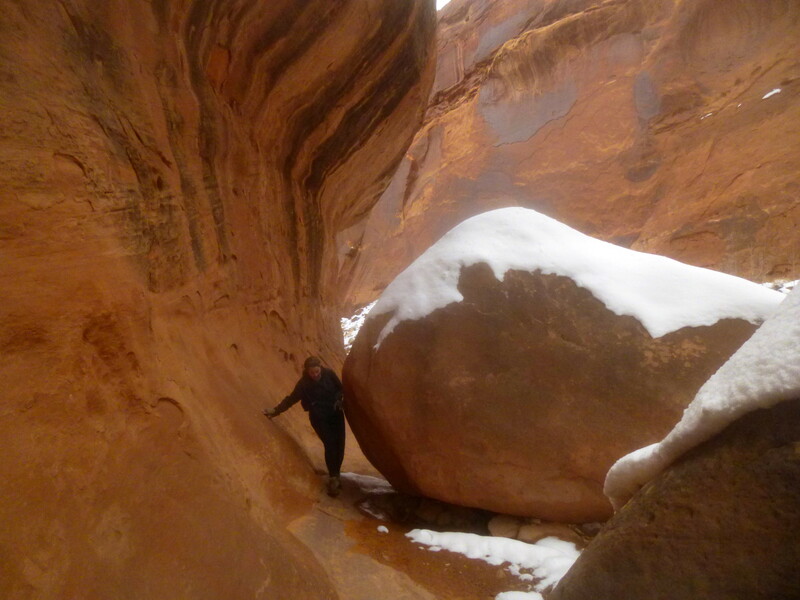 After spotting this impasse on your right, drop back into the wash just above the boulders. The next ½ mile is obstacle-free, until you reach a mushroom-shaped hoodoo that marks the entrance to a short slot. Though probably easily passed on the left or right, climbing up the 4-foot dry fall offers a change of pace from the sandy wash—and a minor challenge, fun for neophyte canyoneers. 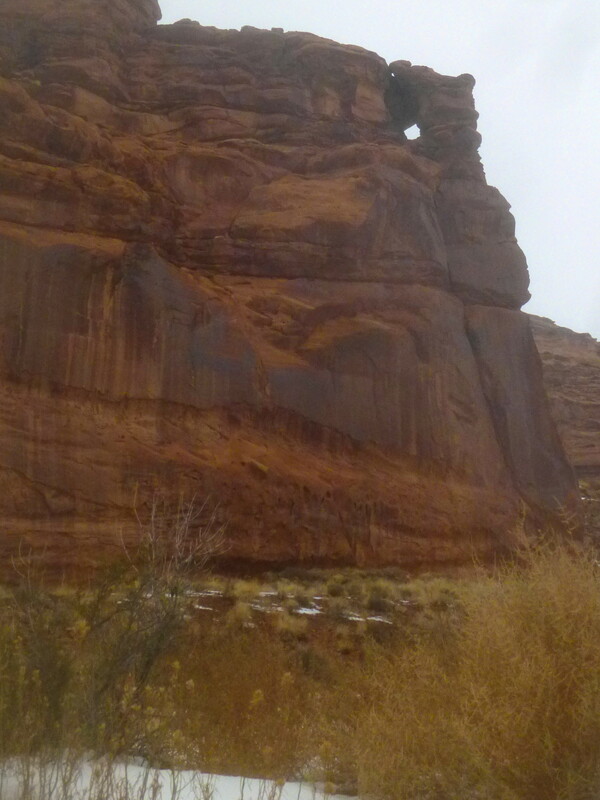 Beyond, the slot quickly dissipates, and the slickrock is again replaced by brush and sand. Around the left-dogleg bend ahead, another slot appears, though this again can be easily circumvented on the right. A third slot section halts progress after a right-turning bend; this one is best bypassed altogether, again by skirting the right flank. 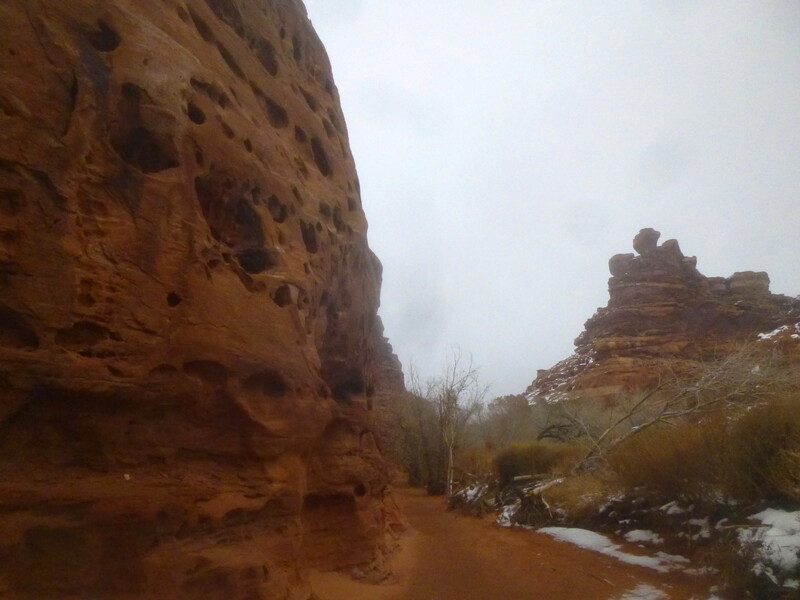 The best views lie ahead, as the sandy wash gives way to gnarly slickrock and the canyon walls appear to narrow. A series of large pools are easily bypassed on the left. 3.4 miles from the trailhead, the highlight of the journey unfolds: a spectacular expanse of slickrock—little traces of vegetation to be found—at the confluence of two forks of Stair Canyon. 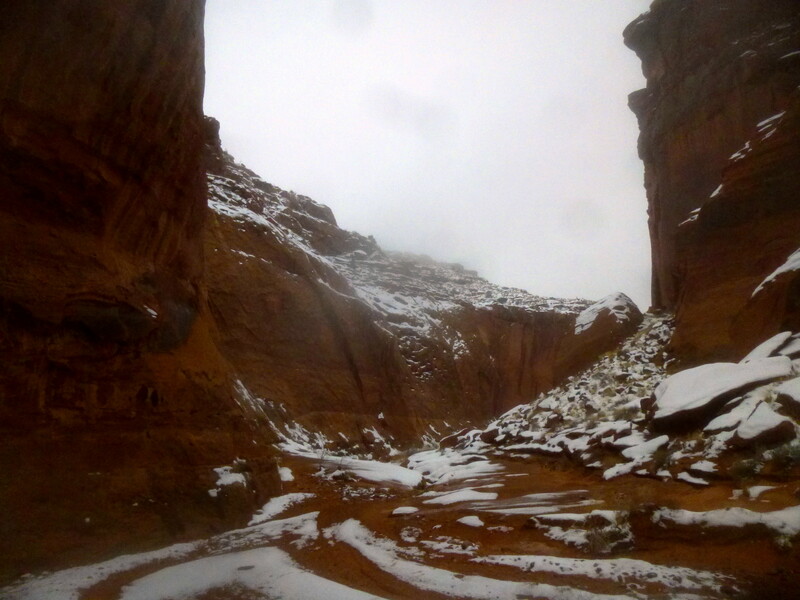 To the left, Stair Canyon proper; to the right, a wider tributary flanked by red-brown cliffs. 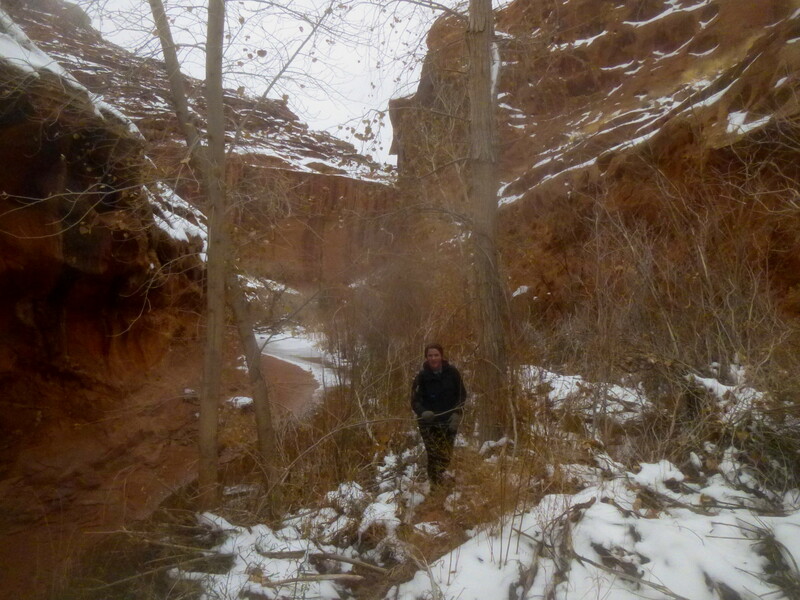 The left fork—the continuation of Stair Canyon itself—quickly narrows just beyond the confluence. The first two rock jams are easily surmounted. A third requires a short friction climb up a 7-foot rock face up to a bench on the left that should be achievable for most. It is possible to continue another 100 yards or so beyond this point before running into a steep pour-off that will be a non-starter for many. Though there are cairns encouraging hikers to ascend a steep slickrock pitch on the left, the climb is at least Class 3—a fall from this tricky slope could result in serious injury. Another potential alternative is to ascend the pour-off itself, though it requires wading into a relatively deep plunge pool and probably chimneying up the slope. The 7.2-mile round-trip day hike has to end somewhere, and the obstacles up-canyon are likely to be even more significant, so this is decent turnaround point. Return the way you come—while the boulder jam just above the willow-swamped narrows is obvious, spotting the scramble down into the narrows is more difficult to spot. Keep your eyes peeled for the rock cairn marking the descent. From here, it is just under 2.5 miles back to Three Forks and Highway 95. 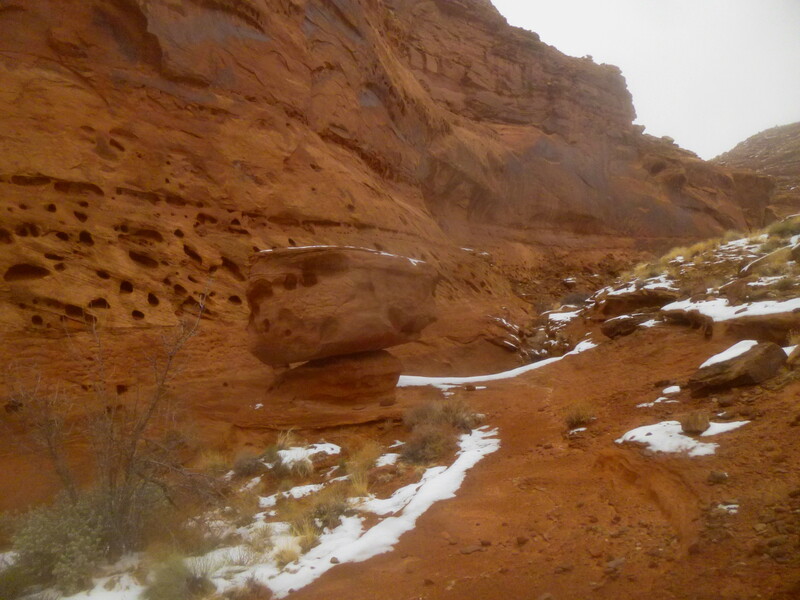 This entry was posted in Moderate Hikes, North Wash, Utah and tagged canyon, Highway 95, Lake Powell, Narrows, North Wash, scrambling, slot, solution pockets, Stair Canyon, Three Forks, Utah, Wingate sandstone, winter. Bookmark the permalink. if you go to the end of cedar point road and look down to the last right fork of the canyon there is a huge arch that is probably as big as rainbow bridge but you can only pick it out when the sun is just shining thru the arch. I can send u a picture if u want.